I’ve also gotten a Fido node number. If you need to reach me that way you can send netmail to 1:3634/24. It’s up 24/7 and accepts crash. There’s a lot more than a handful of bbses up! also you are not considering asian bbses which are very very popular. That’s true. I’ve often wondered why Fido doesn’t have a zone for that area of the world as well. The more I’ve been looking the more boards I’ve been coming across as well. Still nowhere close to the amount back in the early to mid nineties but quite a few more than I though initially. well i think fidonet has seen better days. i guess the russians get a lot of use out of fidonet though. bbsing today is certainly in not the same in many ways. people’s interests are elsewhere and it seems like the people who are cropping up as new sysops are the ones that couldnt cut it back in the real bbs days and they want to tinker around. I, for one, would like to see your fido setup with Ele since 1) Ele boards are very scarce and I am working on one and 2) there is a severe lack of documentation available. I actually ended up switching to Synchronet. 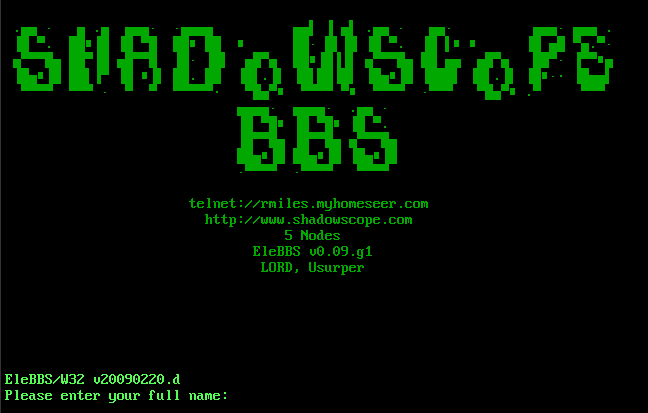 While I love Ele and ran it twelve years ago SBBS is currently being developed while EleBBS is not. I thought about that but as a sysop, what interests me are unique and interesting boards. Not that Synch cannot be unique and interesting. Far too many sysops leave them too stock and they all look the same to me. I think the same can be said for just about any BBS software though including EleBBS. My SBBS setup is somewhat customized, although I do have more to do whenever I get back around to it. Using Baja and JS is a bit of a learning curve coming from menu based setups such as RG, Proboard and EleBBS which are the ones I have always used. They all have stock setups and you’re right, there used to be a lot of Sysops that just didn’t bother. I have it set up for synchronet. Never was able to get ele to do everything I wanted so I moved on.